Samsung’s marketing team has happened upon a rather large number while perusing sales data for its Galaxy S range of handsets, prompting it to post several photos on its Samsung Tomorrow Flickr feed announcing the fact. 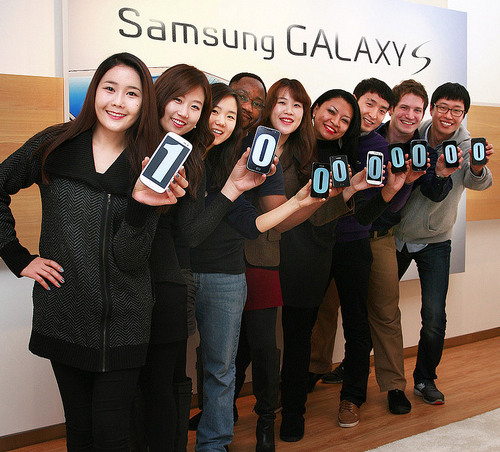 “Samsung Electronics’ flagship Galaxy S series surpassed the accumulated sales record of 100 million units,” a caption reads alongside an image of nine grinning Samsung employees, each of whom is holding up a Galaxy smartphone with a digit on the display to collectively show off the milestone figure. The impressive 100-million total was reached two years and seven months after the first phone in the Galaxy S line launched (in May 2010), the Korean company said. The Seoul-based firm was also keen to point out in its Flickr post how quickly its flagship Android-powered Galaxy S3 smartphone is selling, with 40 million units landing in the hands of consumers in the seven months since it hit the market. “Currently, its average daily sales are 190,000 units,” Samsung said. That’s 7916 S3 phones an hour, which is….a lot of sales when you think about it. The S3’s sleek design, large 4.8-inch screen and myriad of attractive features – face-, gesture- and voice-recognition functionality among them – has proved a winning formula for Samsung. A decent 8-megapixel camera that lets users take photos while recording video has also helped to catch the eye of consumers. Sales of Samsung’s Galaxy S range of devices will be further bolstered by the launch of the S3 Mini and S2 Plus. And when the Galaxy S4 finally hits the market, expect another post on the company’s Flickr page soon after involving an even larger number and another set of employees grinning happily from ear to ear.